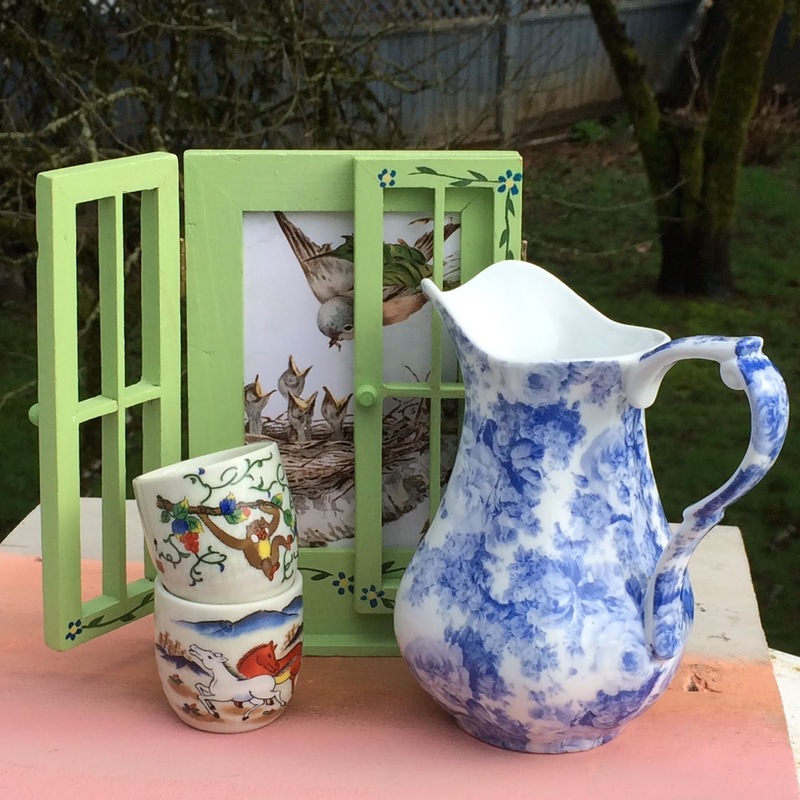 The little wooden green frame was on the free table at the thrift shop, I printed a Graphics Fairy robin feeding babies picture plus added a white cardboard backing to the frame then grouped it with a blue and white pitcher and two humorous egg cups. 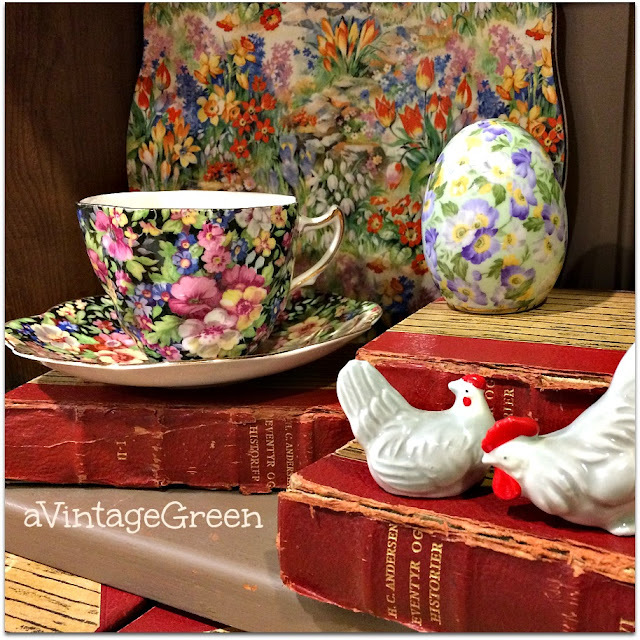 I was happy with the diverse estate and thrifted finds this month. It is always interesting to see how estate and garage sale sellers view the items they offer for sale. Sometimes it seems as though they are a 'retail store in the garage'. That is when I smile, thank them and walk away. 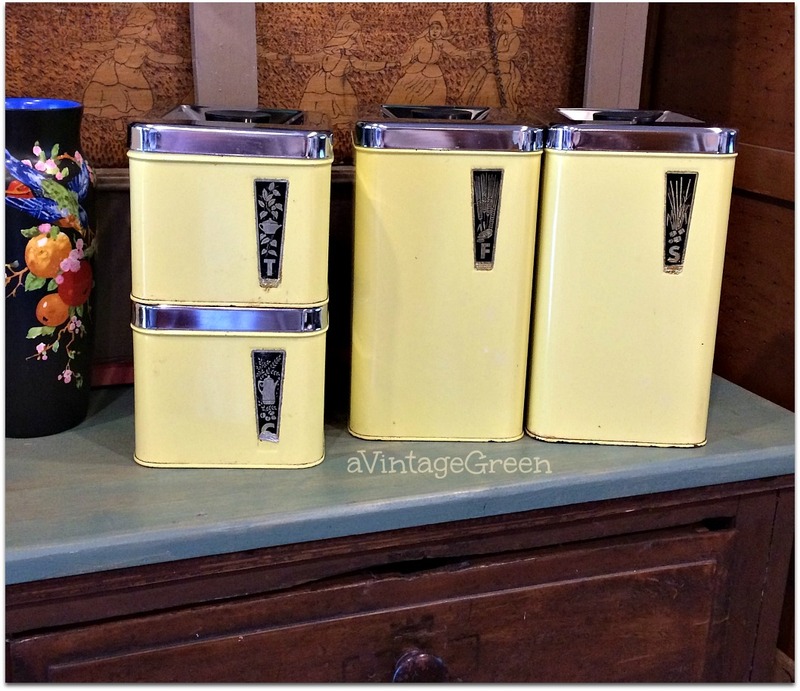 The vintage yellow chrome lidded vintage canister set is displayed on the cleaned off top of my storage cabinet so I now have a bit of photo space (reality shot would not be so pretty). Some vintage kitchenware, first turquoise potato ricer I've seen. The Kimberly Fire King mugs were estate sale top priced finds, ouch prices with a tiny bit of bargaining space. High priced estate/garage sale venues are the exception to most of the estate and garage sales I visit. Most often the sellers want things gone and are comfortable to work with. 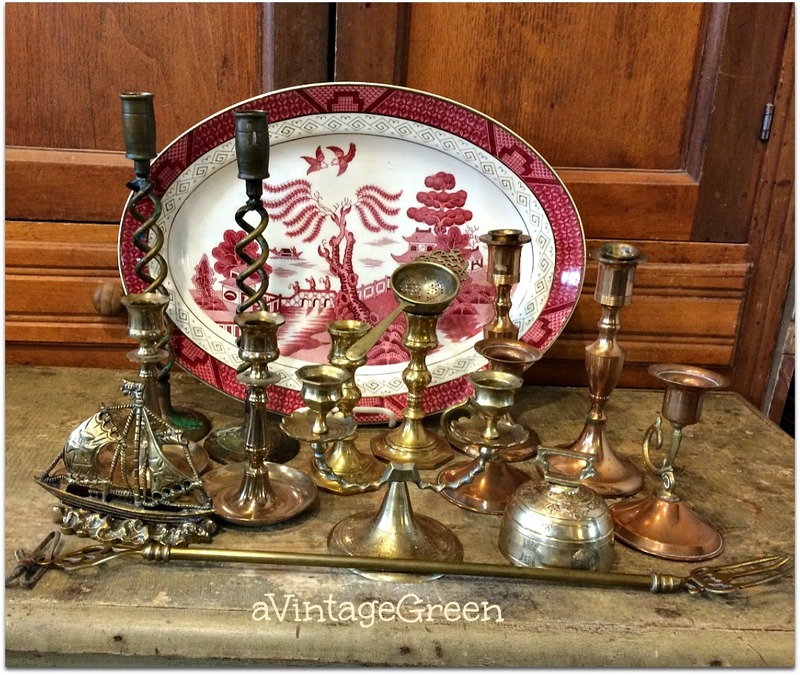 Brass candle holders and a round bell, a tea strainer, elaborate brass candle snuffer, a metal ship ornament and a red Willow platter group. My favorite sales are church sales. Generally the volunteers who run the sales are very organized, price things fairly, have been collecting donations all year and want to earn money for their church. Coffee and snacks are usually for sale and there are always bathrooms. The garage sale season has been very late this year, the city and 'area wide' sales have started in late April. 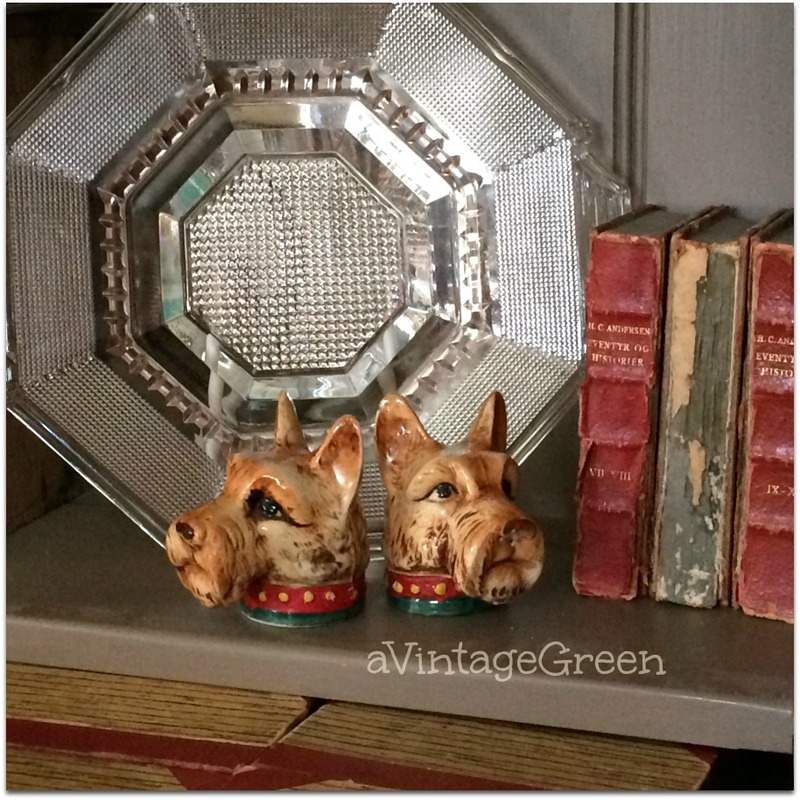 Terrier salt and pepper shakers with an impressed glass deco server and the wonderfully vintage books (seen in the Chintz photo). I always have a list of things I would like to find and over time (sometimes years) the items eventually show up (mostly). I carry a general 'what I am looking for' in my head when garage sales are on but remain open to a large variety of vintage and collectibles finds. Jar of white buttons, blue noxema jar and a brass mouse in a band of sunlight - always so happy to see sunshine after the winter rains. 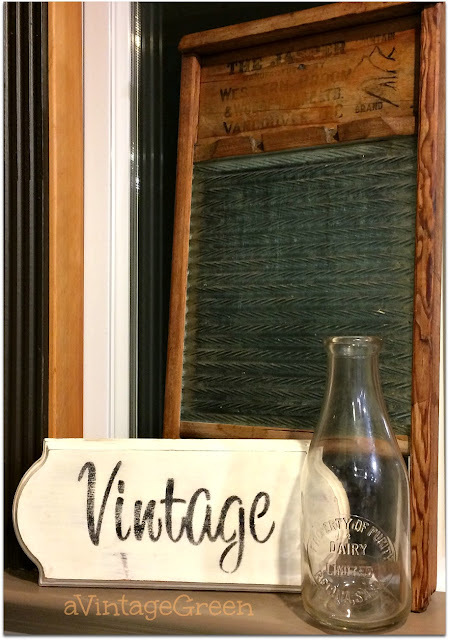 Washboard from my own collection was wiped down with MMS Hemp oil, I painted/stencilled the little Vintage sign and then grouped them with the round embossed Dairy milk bottle on my kitchen window sill. I often find small signs in the thrift stores, over paint them and add a stencil. Joy I really enjoy seeing what you find on your sales trips. Lots of goodies and you also do great makeovers (the frame is adorable). What great finds!! I am in awe of the frame on the free table. Green paint and a stencil made it shine. 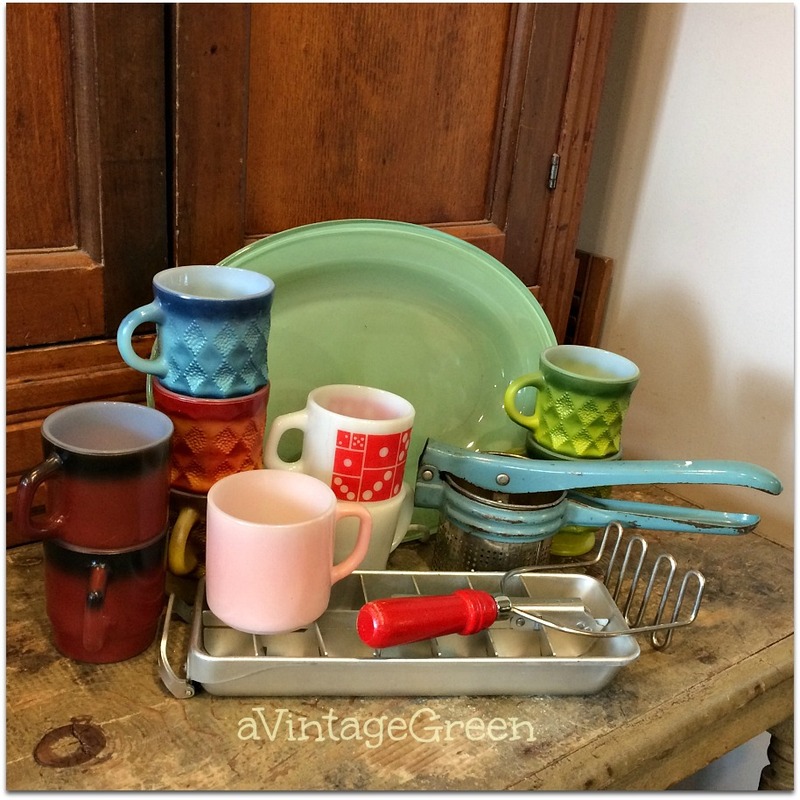 I love that green transferware platter, serious plate envy here. I have some white chickens with red combs too. I like looking at all your treasures! I remember the Noxema jars! Remember when Vicks Vapor Rub came in the blue bottles? You sure have a lot of pretty things! You found so many great things! 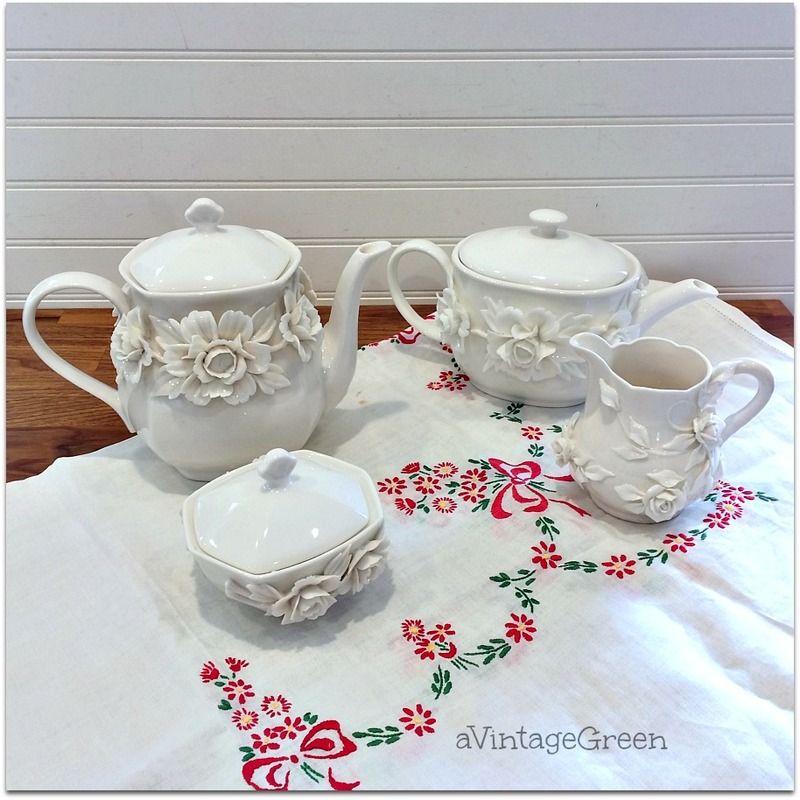 My favorites are the Godinger teapot, sugar bowl & creamer. Beautiful in white. I remember the blue noxema jars, too! Hard to believe they are now collectors' items. wonderful finds! i have only been to a few estate sales and usually find the prices so high there is no room for profit, but ou have inspired me to give them another try. Gorgeous pieces! Especially love those Godinger pieces! Beautiful. I went to my first Estate sale last weekend, pretty much walked in and right back out. They were completely out to lunch on prices. I like you do love a good Church sale though. And I bought snacks at the last one lol. Great finds! Wow, those are some great finds. Those Terrier salt and pepper shakers are adorable. Oh, I love looking at your treasures. I haven't been thrift store shopping much lately but you're putting me in the mood to go. You just never know what you'll find. I love pretty little blue and white cream pitchers...oh and jars of buttons. I have a frame a lot like yours. (it's plain white) Hugs! 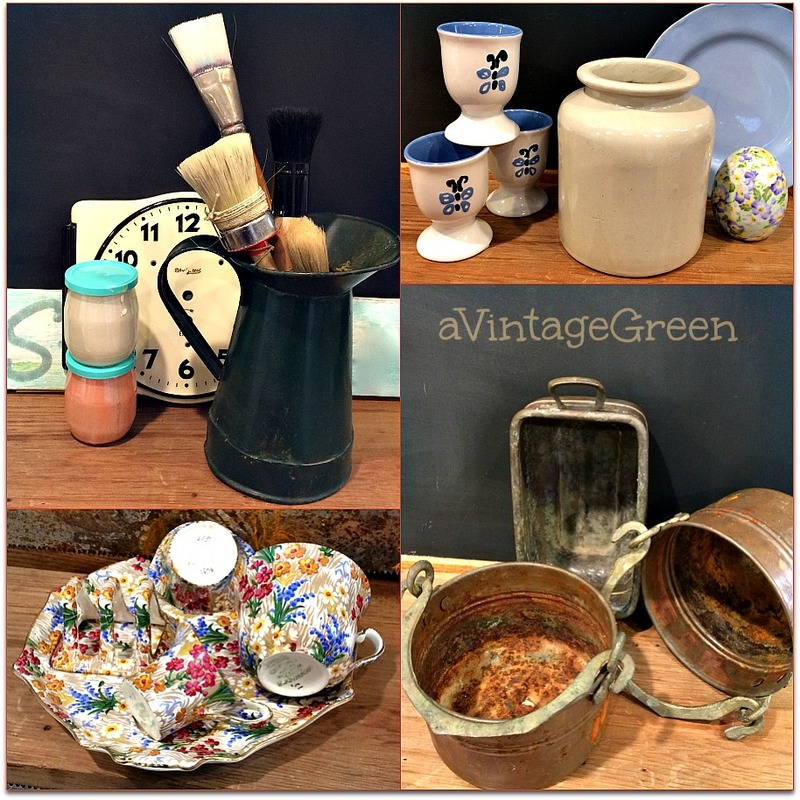 Lots of great finds Joy! I love that turquoise potato ricer!! I have a red one, but would love to find a turquoise one. Always love your made over signs! Thanks for sharing with SYC. Dear Joy, you not only have a keen eye for a bargain, you also have a knack for knowing which treasures will display well together. Thanks for sharing your latest finds with the MM crowd this week. I am new to your blog so have to ask, what do you do with all the things you find? 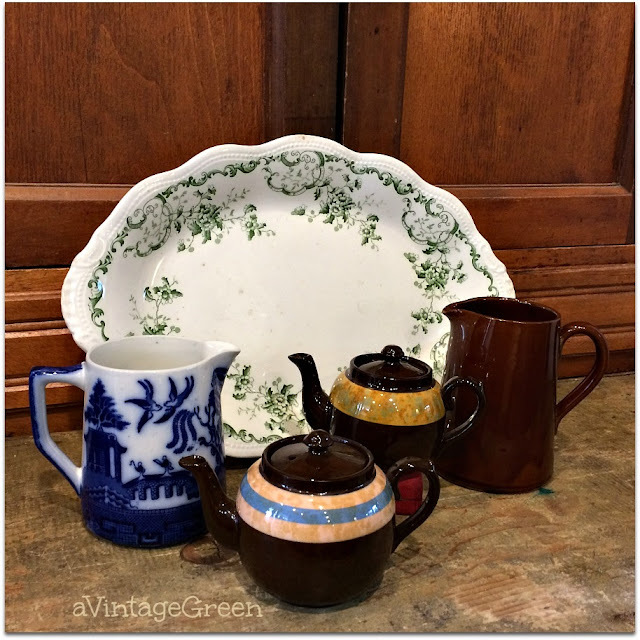 I love to go to thrift shops but have so much "junk" now I hardly know what to do with it all. I have a list too. Otherwise I get so junk drunk I forget what I'm looking for. I always enjoy checking out the wonderful things people buy in various parts of the country. You found some terrific items. I love the chintz. You are an amazing shopper! I love the frame (we live in such small spaces I don't have much room for collections, but that I could use). WOW! What a nice collection! Thank you for attending the #WednesdayAIMLinkParty. I shared your post. Oh wow you did very well in your thrifting this month Joy. I once went to an estate sale and got the shock of my life, I felt as if I was shopping at Saks Fifth Avenue the prices were so ridiculous. I ended up buying one frame. But you certainly know your way around these sales. Jadeite and FireKing are always expensive, I remember Fire King in my grand mothers kitchen, especially those little lidded square fridge containers. Such nice stuff. Do you ever collect depression glass? I love the white ware and for some reason that washboard and I hate laundry !! We had the exact same yellow chrome lidded canister set when I was growing up. Thank you for sharing these incredible finds!